After a great summer of sunshine and vacation, life returns to normal. Teachers are going back to work and children are returning to school or starting daycare. 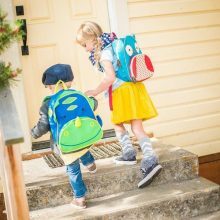 Here are a few tips to help your back to school transition be as smooth as possible as it relates to sleep for our kiddos. A “lovey” (your child's favorite toy) can help bridge the gap while your kid is feeling the lack of mommy or daddy time. This is especially helpful if your child will be napping in a strange place. If your child doesn't have a lovey yet, now would be the time to start having your little one bond to a stuffed animal or safe toy; have the lovey or favorite toy join you in fun activities and cuddle time, and of course nap time and bedtime. It is very important that your child's schedule doesn't shift too much while transitioning to school or daycare. If you know that there will be a bit of change, it is important that you prepare so that the shift isn't as dramatic. Take time to ask what your child's school or daycare's routine will be and start shifting your routine to match. I also highly recommend making sure your little one's nap schedule will be maintained one way or the other: if your child takes two naps normally, but your daycare only offers one, have your child take two naps when he/she is home on the weekends or off days. Nap time routine can be very helpful. If you create a nap routine, it allows your child's brain to signal to their body that it is bedtime. This is especially helpful when your child will be napping somewhere other than home. The nap routine doesn't have to be long and as relaxing as the bedtime routine, but a very shortened version will work just fine. Get on an earlier schedule for the school year. If you have naturally shifted to a later schedule during the summer, and your wake up time and schedule will need to be earlier during the school year, forcing your kids to go to bed an hour or more earlier the day before school starts will probably not work to your advantage. Instead, gradually work on shifting your little ones schedule earlier starting a week or two weeks in advance. Start by waking them up 10 min earlier every day or every other day (gauging how well they are adjusting) and equally shift their naps and bedtime. Sleep regressions do happen, so have a plan of action. Every child has a sleep regression one time or another. But the secret to getting back on track is having a plan of action for when your little one wakes up screaming for mommy or daddy. You may want to give them a minute or two to see if they will resettle before running into the room to “save” them. What you don't want to do is to let them cry for 30min (or more) and then go in, that is essentially teaching them to cry. But if they don't resettle it is best to go in there calmly and reassure them that they are okay. After you have reassured them use the sleep training method that you used to teach them to fall asleep, to help them fall back to sleep again. Do this consistently for every night-waking. Separation anxiety can cause rocky nights. The best thing you can do for this is to focus on spending time with your little ones during dinner and after (the dishes can wait ;-)). Talk to them connect with them and whatever you do, don't rush the bedtime routine, get in all those cuddles, kisses, hugs, BEFORE bedtime so they don't feel like they need it when they wake up at night. Let me know in the comments what you plan to do to ease the back to school transition! Photo courtesy of Mariah Allen Photography. To see more of her photos, like her on Facebook.